Six Bike Repair Stations - Eagle Scout Projects! Please Help; by donating tubes, tires, etc. NO FOOD! The Raccoons will trash the boxes! In June 2018, Mount Diablo Cyclists worked with Justin, Troop#36 (Danville) to install two Mountain Bike Repair Boxes (Eagle Scout Project) at Macedo Ranch and Live Oak Campground. Special Thanks to Valley Spokesmen for paying for the pumps, tools and tubes! 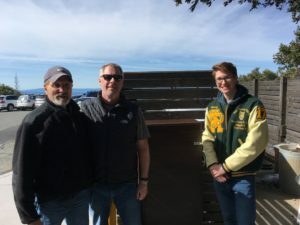 In February 2017, Mount Diablo Cyclists worked with Volney Spalding, Boy Scout Troop #36 (Danville) on his Eagle Scout Project to create two Road Bike Repair Boxes at the Summit and South Gate Kiosk. 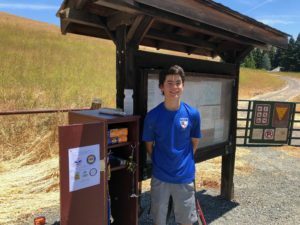 In August 2016, Mount Diablo Cyclists worked with Chris Wong, Boy Scout Troop #815 (Danville) on his EAGLE SCOUT PROJECT to create and install a Road Bike Repair Box at the Junction Ranger Station. Special Thanks to Dave Dalton (6Fifteen Cyclery) for donating the tools/floor pump.